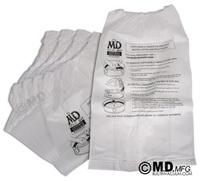 Unique 4 stage filtration (combining cloth, mesh and paper elements) for increased motor life, 12 gallon disposable bags, Unequalled quiet operation due to a patented noise control system. The largest dirt capacity available. Four-stage filtration for increased motor life. The finest, electrical components: Basler transformers, Honeywell relays, and Lamb motors. Electronically spot-welded, 20 gauge steel construction. SilentMaster , Quiet yet powerful operation. This is the result of nearly fifty years of experience in the design and manufacturing of central vacuum cleaning systems. 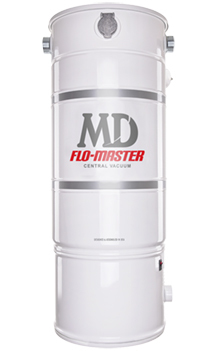 This singular commitment to the central vacuum cleaning industry has produced the patented, innovative characteristics of the SilentMaster, which has led the quest for quiet operation. SilentMaster is a vertical bag-type central vacuum. Why use bags instead of cyclonic action? Bags are the most efficient way to filter a central vacuum. Bagged units exhaust little-to-no debris, saving the motors from being bombarded by vacuumed particles. Owners do not have to externally exhaust a SilentMaster to the outside of a home. SilentMaster exhaust is clean enough to breathe and can be exhausted freely. And when you empty a SilentMaster, there is no billowing dust cloud. All the dust is trapped inside a filter bag, and is easily disposed of. Air intake. The system of tubing goes from the wall inlet to this point. 12-gallon double-bag tapered dirt receptacle only needs to be emptied around twice a year. M.D. Manufacturing's primary filtering consists of an inner porous 2-ply disposable bag. The first layer is slick so the dirt falls to the bottom. The second is where the fine particle filtering takes place. This is supported by a porous heavy-duty cloth bag (blue). Notice the taper of the bags, which allows maximum surface area for maximized airflow. The air in this open area around the bag and near the motors is tremendously cleaner than cyclonic models, thus protecting the fan blades from build up which causes early failure. The secondary filtering (5 stages of filtration in total) is made of breathable foam and plastic fabric. High performance motors in motor compartment are kept clean by the filtration system above it. Exhaust. While cyclonic models normally need to be vented outside, this filtration system keeps the exhaust much cleaner without any need for venting outside. Enjoy longer motor life and cleaner air with MD’s Vertical Bag Filtration featuring Hyperflow* material. Silent-Master’s 1,500 square inches of filter surface area allow sustained performance and fine micro-filtration. The unique tapered design of the filter allows air to be drawn in from the sides of the filters rather than through the debris. An average home only requires the Hyperflow filter to be changed twice a year. SilentMaster features HyperFlow filtration. Our filter bags are a 3-ply microgeometric technology. They are not made like typical paper bags, but are a woven cloth-like material. HyperFlow is engineered for most airflow while still functioning as a filter. MD SilentMaster units have a 12-Gallon dirt capacity. We know that the last thing you want to do is empty your vacuum. That's why we give you the most capacity in its class. A larger dirt capacity also means a lesser restriction of airflow, which means users experience a more powerful vacuum more of the time.